The Dragon® Medical One platform includes industry-leading speech recognition software in the cloud so your staff can be productive anywhere—not just at their EHR workstation. 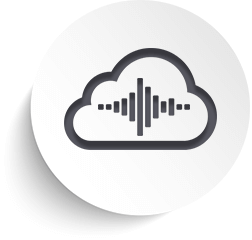 Dragon® Medical One Overview Video illustrates the mobility and productivity benefits of a single voice profile sourced through speech recognition in the cloud. Dr. Reid Conant Video featuring PowerMic Mobile and Dragon® Medical serves as a physician testimonial about the productivity, flexibility and mobility of Dragon® Medical One and PowerMic Mobile. Dr. Levine shares how he uses Dragon® Medical One to create documentation: Webinar: Threes ways to speed documentation. Nuance® Healthcare ID puts power in the clinician’s hand with the ability to personalize their experience and gain access to new features, products, and services as they emerge. Dragon Medical One comes with a secure online analytics portal to track clinician efficiency, productivity and workflows. Use it to help determine what is working and pinpoint areas of improvement for informed decision-making. "This workflow has been essential for us. Now, when the next physician arrives to see the patient, even a few minutes later, the first physician’s notes are already available in the chart for review." Nuance® PowerMic™ III microphone offers simplified, thumb-control operation for dictating, navigating, and editing speech recognition generated documentation.